now normally at a month i would rack at a month and let it continue to age. My cyser just doesnt look ready to rack. What do your cyser look like? plus i have little white frothy things floating on top. Not sure if you can really seen em in the pic. 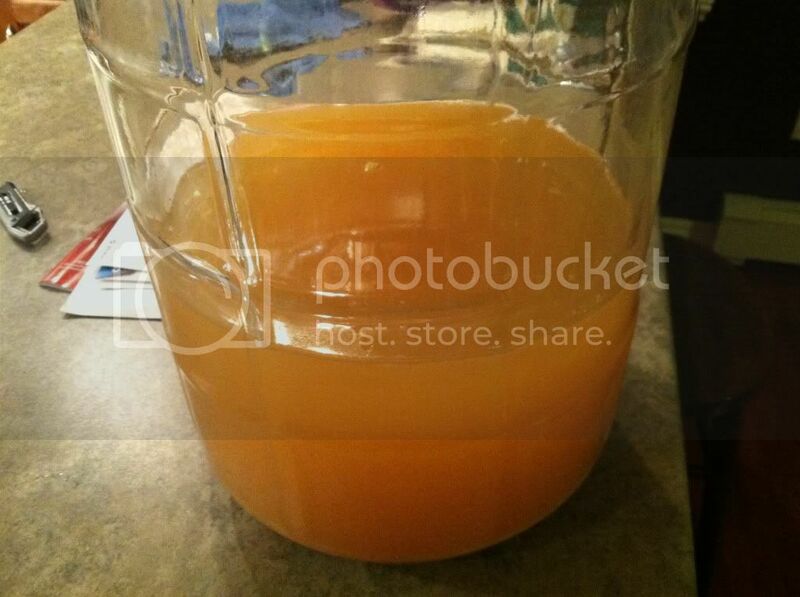 I just bottled my first apple cider Cyser and it looked exactly like that,a lot clearer though. You might want to get it off the lees, mine had tons, I probably worry too much about that though. I wondered about the floaty white stuff too,mine also had some, I think it was either apple residue or yeast, anyway it didn't hurt anything and tasted just like the rest of the Cyser. Oh good yours looked like this also! Is that what you fermented it in? There sure is a lot of head space there, you know? Yup first month. I've had many people tell me it's fine. What criteria are you using to tell you whether the cyser is ready to rack? If the mead is in the primary then wouldn't the SG be a good indicator? I am very new to mead making but when I make fruit wines I rack when the gravity reaches close to 1.000. Why would that be any different with mead unless your yeast is unable to tolerate the level of alcohol in the mead and it gives up the ghost while there is still a considerable quantity of unfermented sugars? i let my meads sit in the primary for a month, then rack em off the fruit and spent yeast. Ill take a gravity and decide if i want to backsweeten or not. I'm also an experienced vintner somewhat new to Mead making and one of the first things I learned is to forget most of what I know about wine making. The best way I've found to describe it is that Mead making is kind of a fusion of wine making and beer brewing. I've found (and read) that Mead definitely does not like to sit on the lees, it picks up off flavors very easily, the general rule I (and apparently many other Mazers) use is to rack at the end of primary fermentation then at least once a month thereafter. This thread got me looking into the subject of floaties in Cyser/Mead. That depends on the yeast. I let my damson plum sit on plums and lees for 4 months. It's beautiful, if needing some age because of tannins. My pyments were on the lees 1.5 months after primary had finished. Leave it on 6 months, you'd want to make sure the yeast wasn't going to throw nasties, but otherwise I've not been too concerned. JOA ready to bottle in 1 month?